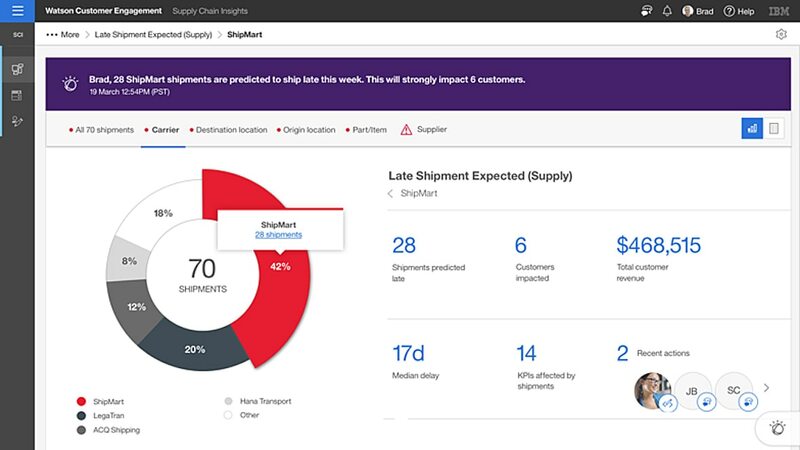 Watson Supply Chain Insights leverages AI, trained in supply chain through machine learning, to provide comprehensive, end-to-end visibility and insights. With Watson Supply Chain Insights, you can now access the unstructured data relevant to your operations; predict, assess and mitigate disruptions; and optimize the supply chain to deliver greater value. View a personalized dashboard of KPIs and significant events -to easily understand and prioritize critical issues in real-time. Get a single view of connected data from across disparate sources to unlock intelligence and new value from your existing systems. Engage in an agile, phased workshop with IBM consultants to assess the value of applying AI to your supply chain. Together, you’ll identify use cases, determine a go-forward approach to accelerate implementation, and build a proof-of-concept using your own data. Choose from three options: Design Camp (1 week), Standard Program (6 weeks) and Premium Program (12 weeks). Use Watson to rapidly assemble the right team to collaborate and manage incidents and resolve disruptions quickly. Watson understands user queries through natural language conversations and deepens its understanding of your supply chain with every interaction and decision. Connect and harmonize disparate data, silos and systems to provide deeper visibility and insights. Elevate your existing systems and achieve rapid ROI with AI-enabled cloud capabilities that allow you to get started quickly. Scale and adapt quickly to changing business needs without compromising security, privacy or risk levels with the IBM Cloud. Learn why Lenovo is looking to IBM Watson Supply Chain Insights as their end-to-end platform.